← Does Congress Need an Evidence Office? 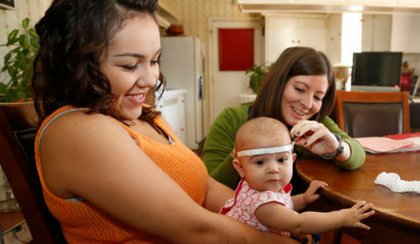 Legislation that would extend the federal home visiting program for another five years, which was included in a final budget bill that was passed by Congress earlier today, also includes provisions that would authorize the use of pay-for-outcomes transactions in the program. The extension of the Maternal, Infant, & Early Childhood Home Visiting (MIECHV) program was included in the final version of the bill. The pay-for-outcomes provisions are in Section 50605 of the MIECHV section of the law. (D) a requirement that payments are made to the recipient of a grant, contract, or cooperative agreement only when agreed upon outcomes are achieved, except that this requirement shall not apply with respect to payments to a third party conducting the evaluation described in subparagraph (B). The provisions would reauthorize MIECHV through 2022. The program technically expired late last year, which has reportedly caused some states to freeze new enrollments. The program is one of a handful of federal initiatives that are evidence-based. This entry was posted in Children and Families, Home Visiting. Bookmark the permalink.